By the end of June, production will cease at the GM Poletown Plant, which could mean the loss of $800,000 per year for Hamtramck. It now looks like the plant will be permanently closed. An old saying used to go that what was good for General Motors is good for America. But folks living in the cities where GM has announced it is ending work at five North American plants would disagree. One of those plants is the Detroit-Hamtramck Assembly Plant, commonly known as the Poletown Plant. The closing of those plants, many say, is not good for America. But there are automotive and financial consultants who agree the closings are good for GM. According to Jeff Schuster, President of Americas Operation & Global Vehicle Forecasting, in an article published online with LMC Automotive consultants, he says GM has to shut down the plants in order to invest in future technologies and consumer trends. That primarily means moving more toward manufacturing SUVs and pickups, as well as gear toward electric-powered vehicles and driverless technologies. In order to do this, said Schuster, GM has to cut costs now and use those savings to invest in the future. “The auto industry is facing the most profound transformation since its inception, going from traditional internal combustion engine (ICE) vehicles, with human drivers, to electric motors replacing ICEs and autonomous vehicles replacing drivers,” Schuster said. 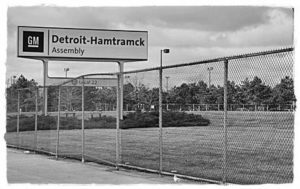 The loss of Poletown, which has a small portion of the plant on the Hamtramck side of the Detroit border, will be financially devastating for Hamtramck, which gets about $800,000 per year in lieu of taxes. There has been much speculation on whether GM is seriously going to close the plants in question or is just using the threat to get contract concession from UAW employees. Well, the answer to that question appears clear now. In a wide-ranging interview with the media at the recent Automotive News World Congress, GM CEO Mary Barra said there is little chance the Poletown Plant will be retooled to build GM’s cars of the future. According to media reports, Barra told reporters that GM also has other plants that are not running at full capacity. That means GM has to concentrate on increasing production at those facilities. She is encouraging workers who will be idled this coming summer to transfer to positions in other GM plants that have current vacancies. Hamtramck City Manager Kathy Angerer recently told The Review that she has been in talks with GM and is being offered assistance by the state economic development department. Angerer said she can’t go into detail on what the talks entail. What is becoming increasingly clear is that Hamtramck has to prepare for a huge financial blow in the coming year.